My New Year’s resolution this year was to make jam. Lots of jam, but in small batches. Instead of going mad in summer and filling my pantry with dozens of jars of plum jam (bright red ‘Billington’, golden ‘Shiro’ or dark red ‘Damson’), I figured I’d take a different tack and attempt to make a different type of jam for every week of the year. I’ve made 35 different jams and jellies so far, ranging from toffee-apple inspired Medlar Jelly to a slightly adventurous choko and lime jam. I can’t claim this invention is entirely mine – I was inspired by this recipe from the blog BraveTart. I added 1/2 cup frozen raspberries for extra colour and flavour, but mostly because I’d thawed out a big pottle of them last night (to make raspberry coulis to go with homemade mascarpone cheesecakes) so I had to use them up. Preheat oven to 160C. Slice rhubarb into even 1cm pieces. Place in a glass baking dish with the raspberries (optional) and lemongrass stalks (if using minced lemongrass, don’t add it just yet). In a small pot, combine water, sugar, vanilla and minced lemongrass. Bring to the boil, simmer for a couple of minutes, then strain through a sieve and pour over rhubarb in dish. Cover with foil and pop in the oven for half an hour. (Don’t overcook it or you’ll end up with rhubarb mush. Which defeats the purpose of rest of this recipe.) BraveTart’s Stella Parks says to cook it till ‘al dente’, so keep checking it every few minutes after the 30 minute mark. When the rhubarb is just tender, use a slotted spoon to carefully spoon it out of the poaching liquid and into 2 x 500ml jars; it should half fill each jar. Then measure the juice that’s left. Strain and pour into a small pot and add an equal quantity of Chelsea’s Jam Setting sugar. Bring to the boil, simmer for 5 minutes, then take off the heat and set aside for 10 minutes or so, until it starts to form a bit of a skin. (The reason you do this is because if you pour it straight into the jars, all the fruit floats to the top.) Fill the jars to the top and seal. Even if I do say so myself, this is such a pretty preserve. Damn tasty too. I don’t imagine mine is going to last very long. In fact, I’m going to fold half a jar through whipped cream to make a rhubarb fool for our pudding tonight. Like the look of this jam. My rhubarb is just starting to poke its head above the soil. Will definitely try it. We ate both jars in two days, which is good because I suspect it’s more of a fresh/fridge preserve than a keeper. 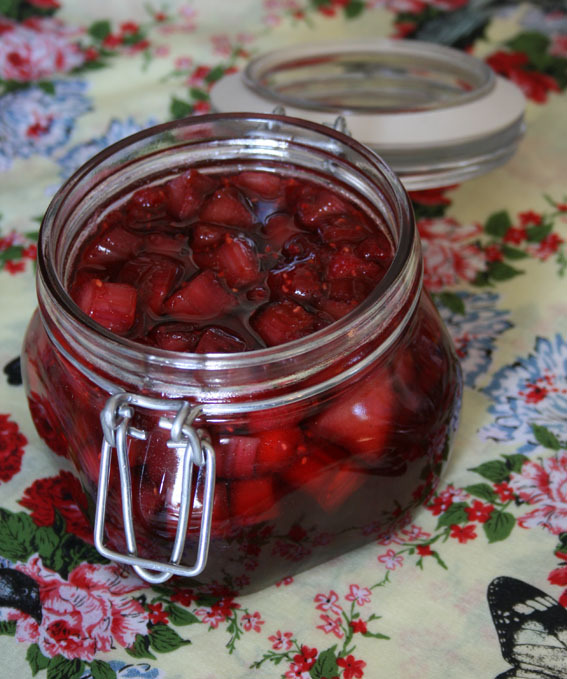 Have you ever made strawberry jam with elderflowers? i had some at my aunt’s house in Germany and it was delicious. After the jam was in the jar she stuck an elderberry flower in for flavor.